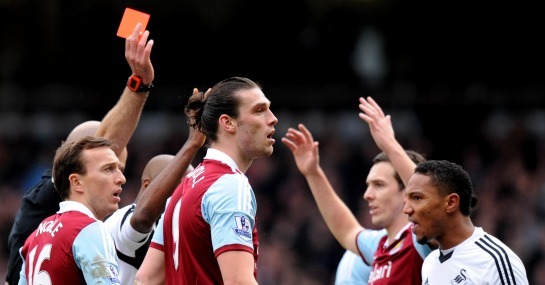 It’s sure to go down as one of the harshest red cards of the season, but the FA’s decision to uphold Andy Carroll’s three-match ban could be the torpedo which finally sinks HMS West Ham. Meanwhile, punters may wish to profit from the wreckage. Facing Premier League games against fellow relegation contenders Aston Villa (16/1), Norwich (15/8) and a very dangerous Southampton side without Carroll, the time to back the Hammers to be relegated at 5/2 is now. To continue the maritime analogy just a fraction longer, West Ham’s ship was already in seriously choppy waters before their £15m man got himself sent-off against Swansea for an ill-advised swish at fellow pony-tail sporting Chico Flores. It must be said that Flores’ reaction was skulduggery personified, but in swinging his arm Carroll offered referee Howard Webb the opportunity to administer the correct punishment for violent conduct. Although the Hammers still claimed three points against Swansea in the end, they remain in the drop zone by a point and can ill-afford to have Carroll sidelined. All season long Sam Allardyce has bemoaned his side’s lack of goal threat, with only a sprinkling of top-flight clubs having scraped together less than the 24 the Irons have mustered thus far. However, against Swansea, the partnership up front between Carroll and Kevin Nolan – which Big Sam has been robbed of through injury and suspension for virtually the entire season – looked back to its halcyon Newcastle best. Both goals were created by textbook nod-downs from the leaping England striker for Nolan to finish in the box, and with considerable aplomb. To be robbed of this combination for three long matches will not only have Allardyce wondering what he did to deserve such luck, but it could also see his side lose to may points to stay afloat as well.